The Moral of the Story... New compilations feature classic rhymes, fables and folklore retold. 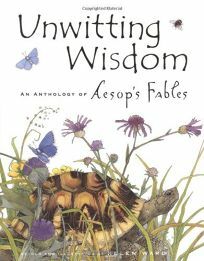 Illustrator Helen Ward contributes pithy retellings and breathtakingly detailed watercolor-and-ink illustrations to Unwitting Wisdom: An Anthology of Aesop's Fables. The tales star the Greek's familiar cast of animals, paired with text that changes font size (for storytelling assistance). An aerial view places delectable looking grapes in the foreground as a fox gazes longingly at the unreachable fruit in ""Sour Grapes."" In the classic race, an enormous hare bounds through a meadow on the fable's title page; two spreads later, past beds of wildflowers, the tortoise plods to victory. (Sept.) .